Out presidential candidate Pete Buttigieg has surged to third place in the early primary state of New Hampshire, a new poll of registered voters shows. Buttigieg trails former Vice President Joe Biden and Senator Bernie Sanders. The three men are the only candidates polling in double digits. 22.9% favor Biden, 15.6% prefer Sanders, and Buttigieg claimed 10.7%. Senator Elizabeth Warren (8.7%) and Senator Kamala Harris (6.8%) round out the top five. 11% of likely Democratic caucusgoers in Iowa said that they would pick Buttigieg as the 2020 Democratic presidential nominee in a recent Emerson Poll that showed the candidate in third place there as well. The numbers for Biden and Sanders were similar, although Harris scored fourth place in that poll. Buttigieg scored 0% in the Iowa polling in January. 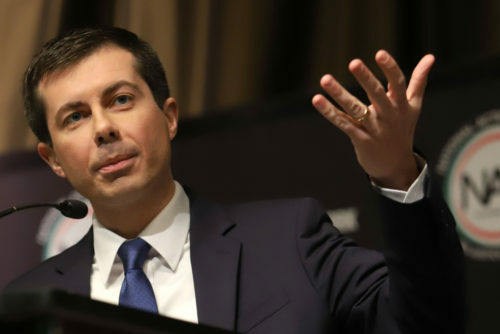 “The emerging dark horse in this race may be Pete Buttigieg, who has gone from a virtual unknown to vault to 11 percent support, trailing only Biden and Sanders and ahead of Warren,” New Hampshire Institute of Politics Executive Director Neil Levesque said in a press release. Buttigieg also had the lowest “unfavorable” rating of all 14 candidates. His name recognition rate skyrocketed to 69.9%.